(via the Internet) to a one-of-a-kind 100% Veteran-issue driven talk show and news hour. 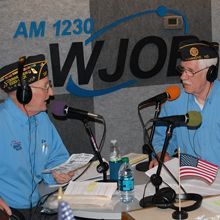 For nearly two years now the American Veteran population in and around Hammond, Indiana (A South Suburban Chicago region) has been enjoying a once a week, Friday morning hour-long talk show where “Veterans are helping Veterans” live on the air. Thanks to the live-feed of the Internet, Veteran listeners across the US and around the globe are now encouraged to join the show live on Friday mornings. The show focuses on helping Veterans with an array of issues such as benefits, health care, education, employment, finance and more. The shows producer and hosts keep up-to-date on a variety of news coming out of the Veteran Administration, Department of Defense, Military news services as well as private sources – all intended to serve and help to Lake County, Indiana veterans and their families. However, with the capability of the Internet, the shows producer and hosts feel they can now be of great benefit and service to Veterans around the globe. To take the first step towards this effort the group will now begin taking live calls from Veterans outside of Hammond. Since the group has two National certified Veterans Service officers, they feel the time has come to expand their reach to include a portion of the show that appeals to general help for Veterans across the US and abroad. TV Show: Veterans have the opportunity to fill out an online question and have it answered on a daily news channel in Pennsylvania.